The ADF Series is a family of high power, single phase or three phase, AC Power Sources. Available models range from 15kVA to 90 kVA . Using a modern user interface for ease of use, the ADF Series is cost effective and fully programmable for basic frequency conversion and power test applications. For questions regarding the AFX Series and or custom solutions, please contact us directly or try our live chat. The ADF Series consists of a range of High Power switch-mode AC Power Sources covering a power range from 15 kVA to 90 kVA and higher if needed. ADF models are available in either single phase or three phase output configurations. The ADF uses state-of-the-art digital power conversion technologies. 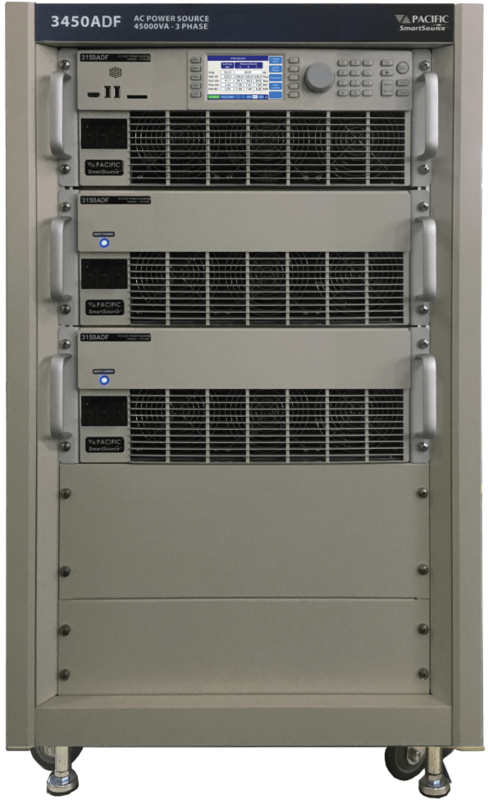 Power density is among the highest in the industry allowing 15 kVA of power in only 4U (7″) of rack space. Great emphasis has been placed on energy efficiency, ease of installation, and maximum power per cubic inch of rack space. 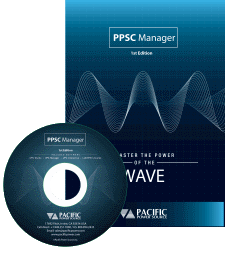 Control and operational features provide a high degree of application versatility and ease of use for the test engineer. Applications range from manually controlled frequency conversion to programmed ATE AC line testing of AC powered products. Power conversion within the ADF Series is achieved by digitally controlled, high frequency pulse width modulation, resulting in energy efficient operation. The ADF includes standard analog and digital I/O functions for integration in automated test equipment (ATE). Standard output frequency range is from 45 Hz to 500 Hz, covering all commercial and industrial power frequencies as well as typical 400 Hz avionics testing. The available F option offers frequency range extension down to 15 Hz for railway applications and up to 800 Hz for wild frequency avionics applications. All ADF models have a single voltage range with constant power profile. This eliminates the need for switching between a high and a low voltage range. If desired, a low voltage range can be simulated. Maximum current ratings shown are available up to 120Vrms. Voltage and Current follow constant power profile so higher current at lower voltage and lower current at higher voltage is available. Three phase input: -2 Models: 208 to 240 VAC ±10% input range. -4 Models: 380 to 480 VAC ± 10% input range. All models have active power factor corrected AC inputs. 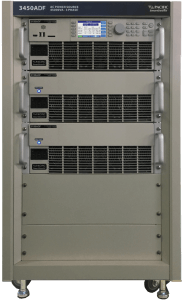 Cabinet systems rated at 60kVA or higher are require 400/480Vac Input service (-4). Cabinet weights are approximate and vary with certain available cabinet configuration options. Standard Models in Power Levels from 15 kVA to 90 kVA. Contact us for higher power. All ADF Series power source models are equipped with a digitally Programmable Controller. All operating functions may be controlled from either the front panel or from a remote RS-232, USB, LAN or GPIB interface. IVI Compliant Instrument Drivers are available. Provides for exceptional accuracy of the AC output Voltage. When enabled, accuracy improves to ±0.02% referenced to the power source internal voltmeter. Create and save output settings (programs) for quick recall or set user defined soft key quick set values for commonly used voltage and frequency settings. 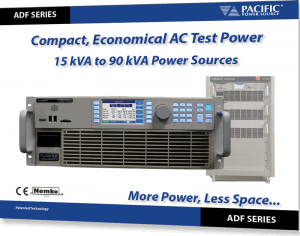 The ADF Series Power Source is equipped with several powerful Digital Signal Processors to create a fully integrated test system. It supplies a variety of power conditions to the device under test and meters all output performance parameters. Patented technology is used to minimize any DC offset at the output of the ADF AC soruce. This reduces the risk of saturating AC input transformers on transformer coupled EUT input stages. The ADF Series is an excellent source of stable AC voltage over the frequency range of 45 to 500 Hz. The output frequency is accurate to 0.01%. Available F Option extends frequency range to 15 ~ 1200 Hz. With the ability to provide singe output, the single phase 1150ADF is the perfect choice for 3 Phase to 1 Phase conversion. The ADF Series controller offers both manual and full programmable control. Front panel operation is menu driven using a combination of direct access menu keys to the left of the large color display and 5 soft keys located on the right of the display. The rotary knob can be used to scroll through menu fields and doubles as an ENTER key. The same knob allows for slewing of output parameters. A full decimal keypad is provided as well for direct parameter entry. The ADF can also be operated remotely from one of its included remote interfaces. Operation from a web browser via LAN or USB is also supported through the embedded web server of the ADF. All ADF models are designed for operation in 19 inch equipment racks. Models above 15 kVA require parallel operating of one ADF Master unit and one or more auxiliary no-controller (NC) units. Models 1300ADF through 3900ADF are available as cabinet systems with all internal input and output wiring, terminal blocks and parallel connections included. Standard 19 inch rack. Slide rails are available as an option for all ADF units. Front forced air intake with rear exhaust. Automatic Fan Speed Control for low acoustic noise and extended fan life. The available energy saving sleep modes of the AFX result in low power consumption during idle periods and extend the life of the product. 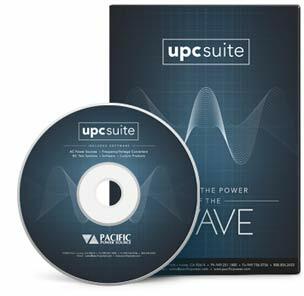 Pacific’s line of Smartsource® AC Power Sources enable engineers to easily automate their testing by using industry standard software development environments. The ADF series offers standard Ethernet/LAN connectivity, a browser interface, LXI compliance (LAN extensions for Instruments) to ensure inter operability with other LXI instruments and IVI (Interchangeable Virtual Instrument) driver to speed up ATE test program development.